How to login to the M7350’s web management page? The web-based management page is a built-in internal web server that does not require internet access. 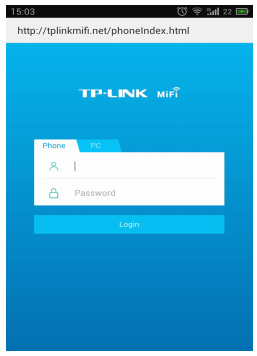 It does however require you device to be connected to the TP-Link device. 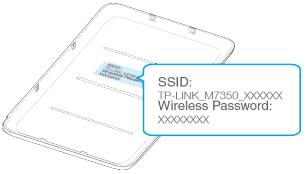 You can check the SSID and Wireless Password on the screen or rear cover label of the device. 1) Press the MENU button to display the menu. 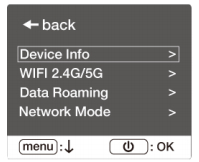 2) Press the MENU button to scroll to Device Info. 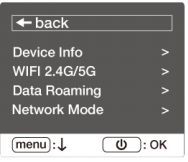 3) Press the button to enter Device Info. Find out the SSID on your laptop, phone or pad etc; then key in the “wireless password” of the router to get connected. 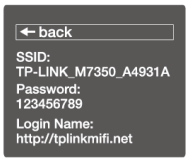 Step 2: Once the wireless is connected, please open the web browser and type in http://tplinkmifi.net or 192.168.0.1 in the address bar. When the login window appears, enter admin (in lower case letters) for both Username and Password, and then click the Login button. If you cannot login with admin, or you’ve changed the login username or password but forgot it, please try login on another laptop, tablet or phone; reset the router by using a pin to press and hold the RESET button (hole) for about 5 seconds, until the screen displays “Power Off”; then release the button and wait the Device to reboot and restore its factory default settings.